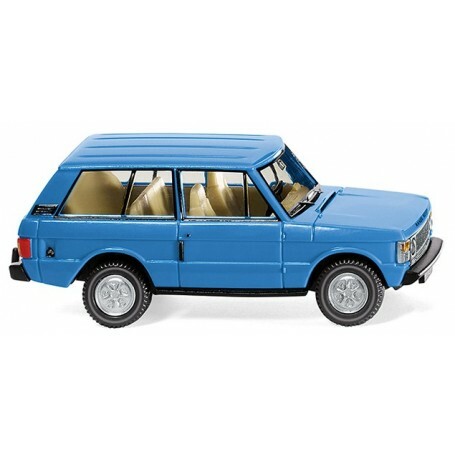 Range Rover - blue, 1970. Vehicle body sky-blue, interior sand-yellow. Bumpers with chassis, but also steering wheel and radiator grille in black. A-, B- and C-beam in sky-blue. Wheel rims painted silver. Headlamps are transparent inserts, 'Range Rover' lettering on the front of the bonnet in black. Door handles and fuel filler neck in black, tail lights red, indicators orange and reversing light imprinted silver. Rear lettering 'Range Rover' black.